Nordstrom Fall Trend Show 2016! //Cheers Marie - live life and enjoy! I attended the fall trend show in Park Meadows Mall Nordstrom here in Colorado. It was a super fun event, kinda similar to Nordstrom Spring trend show I attended last spring. Lots of make up! Nars, Chanel, Bobbi Brown, and Mac! Lots of make up demo, lots of free samples! I paid $20 to get in and it gives you back a $20 gift card so its just like buying a gift card. Thanks to leah and crystal for adding me to their vip list and i got to sit in the front row! nothing like front row sitting in a fashion show! 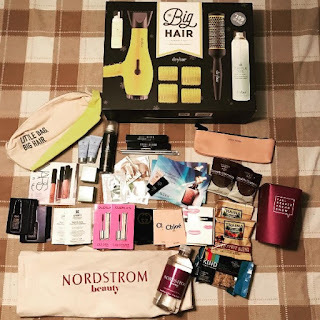 Nordstrom give a away a bunch of freebies! I got free make up at Bobbi Brown, Kelly did a great job with my make up. I bought some stuff at Bobbi Brown counter. Another lady named Kelly at the dry bar did my hair. Love the curls! Finally invested on that dry bar yellow blow dryer and bunch of goodies! I had so much fun! its a like get a way from the kids. Got make over for free! Ps. thanks for all the support you guys gave me with the zombie crawl video and blog post!